What’s the best way to organize your sound effects, field recordings, and sound design clips? The last two articles have explored ideas. 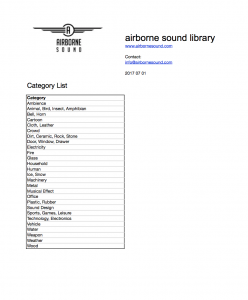 The first post shared sound fx library categorization basics. Last week’s article included 13 tricks and tips for categorizing a sound library. Those shared the concepts. What does this look like in practice? Today’s post describes a quick workflow for creating your own sound fx library category and subcategory list. The post also deconstructs a sample field recording tree. It shows the thought process behind building a category and subcategory list that you can use as inspiration for building your own method of classifying sound effects. How do you begin classifying your own sound effects? Who will use it? This is the most important question. Who will be browsing the sound clips? Yourself. The method you use is malleable. After all, you may not know the type of clips you’ll collect. So, you can evolve your classifications freely as your library grows. Colleagues at a post facility. You’ll need to incorporate facility phrases and industry shorthand that editors there are accustomed to. Customers on a Web shop. Simple language and intuitive access is best. Where will the library be accessed? Not all sound libraries are experienced identically. How will people be browsing the categories and subcategories? Local files and folders or on a networked server. Do you use your sound library yourself in files and folders on an exterior hard drive? Perhaps your indie game studio has a shared NAS with the libraries on it. Limit organization to one- or two-level categorization. That ensures users don’t become lost clicking through endless desktop folders. 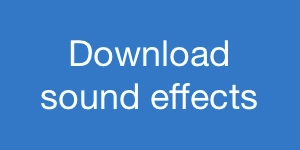 Sound browsing software. Will you (or your fans) be using metadata apps like Basehead or Soundminer to sift through categories? 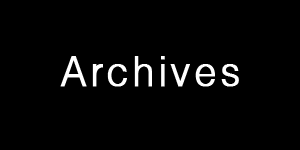 If so, most of the organization can be done in metadata and the files themselves can be gathered more liberally. Web shop. e-Commerce fans become lost when more clicks are required to reach the sound they need. Limit the number of subcategories. Use the three-click rule to avoid Web browsing attrition. What type of clips are they? Do you want to organize field recordings, sound design clips, production music, or a blend? Field recordings. 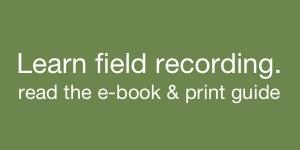 People usually search field recordings by what they are first. They consider what those things are doing only after they find the boat, car, or dog they want. So, categorize field recordings using nouns. Sound design. Are you a master of samplers and plug-ins? These rich clips of crackles, zaps, and warbles aren’t easily described. Your fans may not know whether to search for a desolate planet soundscape, a wizard’s dungeon cavern wind, or a forsaken moor for a horror film. What about a logo rise-to-hit, a “production element,” or a sfx stinger? They could all potentially be the same sound, after all. So, use verbs to categorize them. Typically the category will describe the tone (e.g., airy, subsonic), and the subcategory will detail the motion or activity (e.g., whoosh, blast, crash). Production music. Use the genres your fans expect. For example, general music libraries will use basic genres. Is the collection focused on electronica? Feel free to embrace the narrowest categorization of breakbeat: Baltimore club, big beat, broken beat, nu skool breaks and others specific to that subgenre. Mixed clips. Mixed collections are best categorized with the dominant clip type. For example, a field recording library may have many nouns, and a category labelled as “Sound Design” that tucks every manipulated sound within. Sound design libraries may have a single “Field Recordings” category with all field recordings amongst the verbs of Hums, Distortion, and others. It’s common for production music libraries to have an “FX” folder for all non-music clips. It is indeed possible to have a hybrid of both nouns and verbs, just be aware that will double the size of the first-level categories. Broad or narrow? This step considers how the categories themselves are presented and browsed. Broad categorization. Want to see all data at one glance? List every conceivable sound classification in categories at the first level. Narrow categorization. Do you prefer a tidy list that can be scanned quickly? Narrow categorization has fewer categories and many subcategories within them. Let’s look at an example. 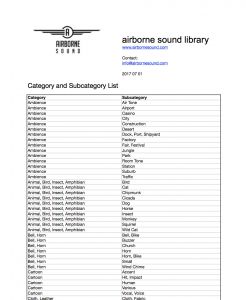 Here is a category and subcategory sound library tree is taken from my own Airborne Sound library. It was initially inspired by clients I worked with (Sound Dogs, Sound Snap, Sonomic, and others). I found those category trees weren’t a perfect match for what I needed, so I spent almost two decades refining it. It now works for every sound clip I need classified. Now, it’s important to note that it may not be the perfect fit for your sound library. Why? The idea is not that you copy this category tree. 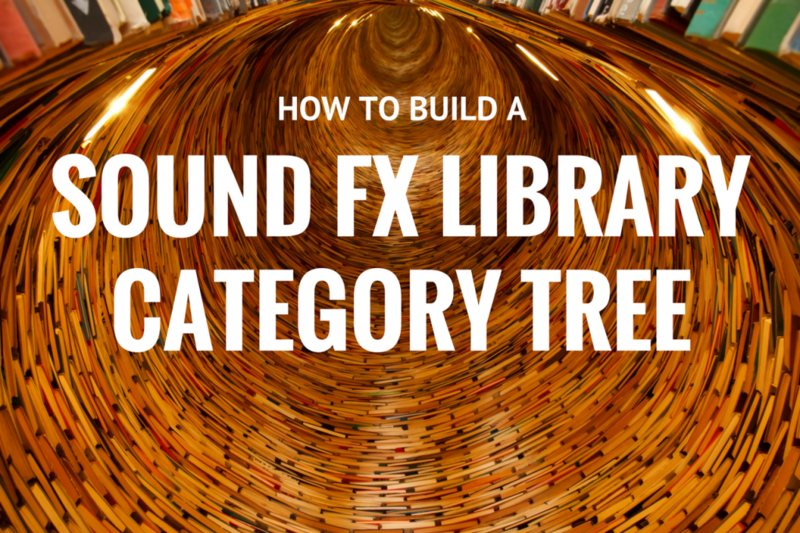 Instead, the point is to show how a category tree is built, and how you can do the same for your own needs and your own sound fx library. Download the XLS spreadsheets of the category and category/subcategory. Why are the categories arranged like this? What is the story behind this sample sound fx library category tree? The entire idea for Airborne Sound fx category tree is to help access its individual clips on the Web. That’s how I originally began sharing it back in the mid-2000’s. I work on my own, so there wasn’t any need to share locally or with colleagues in a post facility. So, it was designed for customers on an a la carte Web shop. What’s the impact of this? Well, it uses simple, common one-syllable words. That makes the easy to access for the type of people who search Web pages. While English-speaking sound pros may know complicated words and trade names, the library defers to instantly recognizable words to increase the chance many people worldwide will understand the categories (or via Google Translate). It’s also designed so any sound can be reached in three clicks: clicking the category, then the subcategory, then the sound itself. Quick access is vital when Web shop users can depart the instant they become frustrated. It’s also designed to catalog one type of sound effect: field recordings. That’s why most of the categories are nouns: Vehicle, Weapon, Weather. The subcategories are nouns, too. So, in Vehicle there is Bicycle, Bike, Boat, and Bus. Weapon includes broad classifications of nouns: Gun, Pistol, Machete, Whip. And Weather breaks down similarly with Rain, Thunder, and Wind subcategories. The library doesn’t have many designed sounds. That’s why they’re all gathered in the main “Sound Design” category, with a variety of verbs and nouns within it. That structure is more of a “catch-all” for anything not based on a real-world sound, so it’s a bit of a jumble. This wouldn’t work if there many nuanced designed sounds. 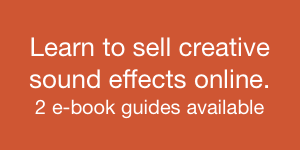 In that case, it’s better to expand the Sound Design category into more specific terms. But, in this case, designed sounds are less than 16% of the Airborne Sound library, so it’s a compromise. There are only 27 categories in the list. So, the library adopts the “narrow” categorization method. Again, the reason is because of Web browsing access. A smaller amount of categories is sensitive to the mercurial habits of Internet customers: it encourages a swift initial decision, then finer decisions in the subcategory screen. A combination of a small list and simple terms makes decisions easy when time is short. You’ll also notice that some categories are missing a familiar subcategory. For example, “Weapon” is lacking “Rifle,” or “Submachine Gun.” That’s because I don’t have any recordings of those sounds. Skipping those subcategories is okay. The “narrow” categorization method keeps the 27 categories rigid. Instead, the changes are made in the subcategory. So, adding a subcategory for those two weapon types is easily done without disrupting the initial category structure. That ensures the categories remain easily scanned; Web browsers won’t have to re-evaluate them every time they visit a store. They will expect the subcategories to change though, so adapting to new information there will be natural. Those are the broad ideas behind classifying a library of field recordings intended to be shared online. There are also some finer details in the structure, too. Word choice. 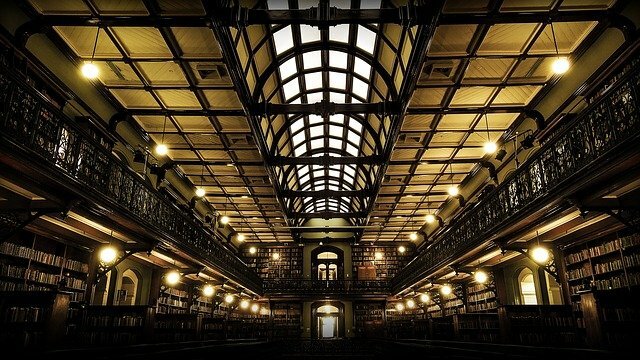 The library uses certain words to raise the chance they will be found in Google searches. The terms are singular, since people usual search Google for “cat sound effects,” not “cats sound effects.” It also doubles up on international names (e.g., “French” and “France”) for the same reason. Synonyms and grouping. Synonyms and similar sound terms are grouped together. “Dirt, Ceramic, Rock, Stone,” groups similar substances in one category. That’s helpful since sound browsers may use some terms interchangeably. It’s also common to search for “Rock” sounds, and realize “Stone” sounds will work just as well. Doubling up on “Hit, Impact,” and “Break, Crash, Smash,” groups clips that will sound similarly or identically; only the name is different. A few categories and subcategories are interpretive. So, Household and Office are a bit loose. After all, a waste paper basket could appear in both, although Office would be the most common choice. Some other interpretive choices are blending all non-human living things in one category: Animal, Bird, Insect, Amphibian. 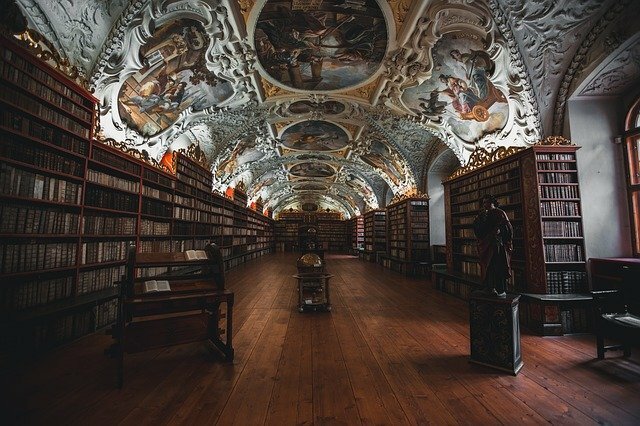 More animal-centric libraries may separate them into their own categories. There is also crossover between Office and Technology, Electronics. The idea is that the latter is more high-tech and the former is centred more on Foley. “Ambience” could conceivably include “Crowd” sounds, too. However, Crowd is broken into its own category since the amount of crowd sounds is so vast and varied. Those are very common with the “element” subcategories of Metal, Wood, Ice, and so on. They’re identical between them to help teach sound browsers the terms the library uses. The “Various” subcategory also pops up, which I’d recommend avoiding unless you have no other option. What’s the best way to categorize your own sound library? It’s different for every collection. 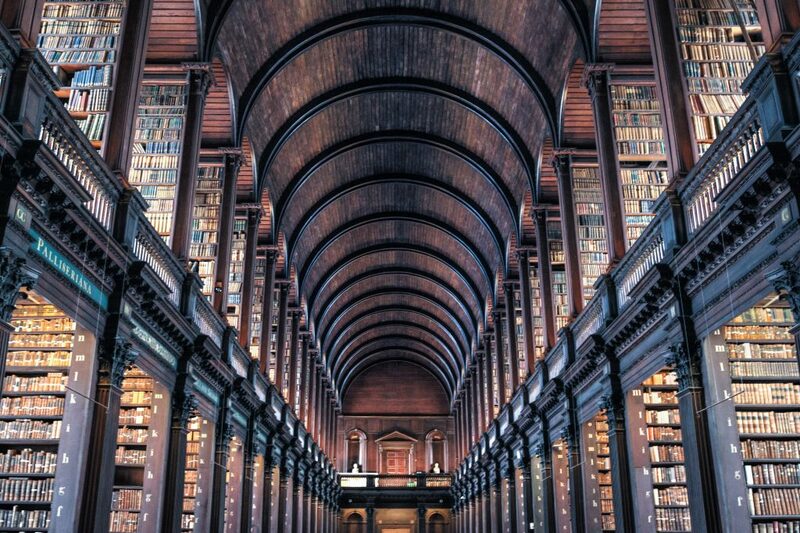 Start by considering the four steps to sound library classification: who is searching, where they will do it, the type of effects in the collection, and how they’ll be presented. Then, contrast your ideas with the online Web shops and other sound libraries. With care, your classification will help your fans browse your sounds and discover the clips you’ve worked so hard to create.